We’ll be honest with you! We’ve dined at other Planet Hollywood locations and even this Planet Hollywood at Disney Springs before it underwent its transformation and reopened in 2017. We have never been overly impressed. In fact, after bad service and not so good food, we had no plans to return. BUT – with Disney Springs Planet Hollywood being reimagined into Planet Hollywood Observatory, our curiosity got the best of us and we wanted to try it. To make a long story short… the new Planet Hollywood Observatory “up-do” is a huge success in our opinion, as it is nothing like its past self. We are surprised to say we loved our experience at Planet Hollywood Observatory – and here’s why! Easily, one of our favorite things about Planet Hollywood is it’s fantastic location at Disney Springs. It’s a hot stop not only because of everything listed below, but because it stands out as it straddles the line between Town Center and the West Side of Disney Springs. Just steps away from the Orange Parking Garage, right around the corner from the Disney Resort Bus Station, and pretty close to the West Side Boat Launch, we love the easy access especially compared to the trek that we used to have to take when dining here. So, whether you plan to spend the day strolling through Disney Springs or just dropping in for a meal at Planet Hollywood – you won’t have troubles locating this one! While we like to plan ahead and make dining reservations 180-days in advance, we’ve found Planet Hollywood Observatory is also a good place to pick up last minute reservations. Want to just wing it with no reservations? Planet Hollywood is usually accepting walk-ins without reservations with short wait periods. Sure, this isn’t always the case, but we’ve been pleased to see how quickly they seem to turn tables for waiting guests. Lunch begins at 11:00am and runs until 4:55pm. Dinner is served from 5:00pm until 11:45pm. 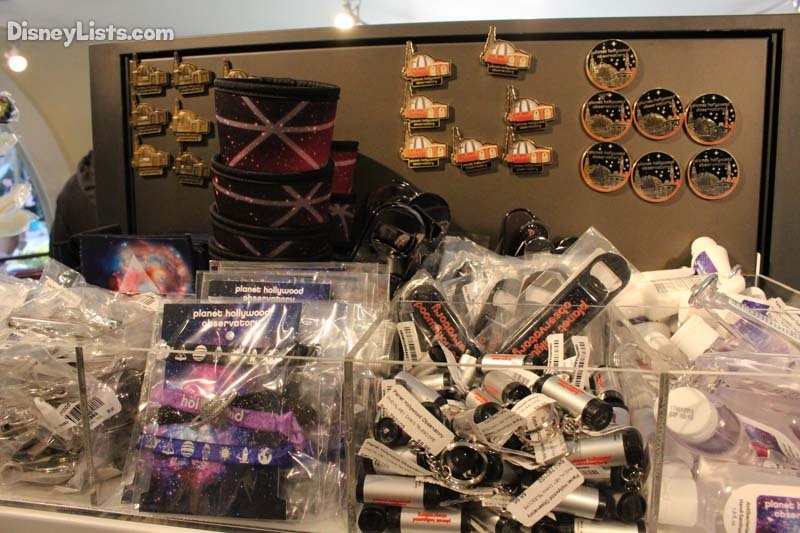 Chances are you’ve been shopping all day if you are at Disney Springs, but it was still nice to stop in to the Planet Hollywood store located within the restaurant. They had a good variety of apparel and housewares… most of which sported the Planet Hollywood logo. 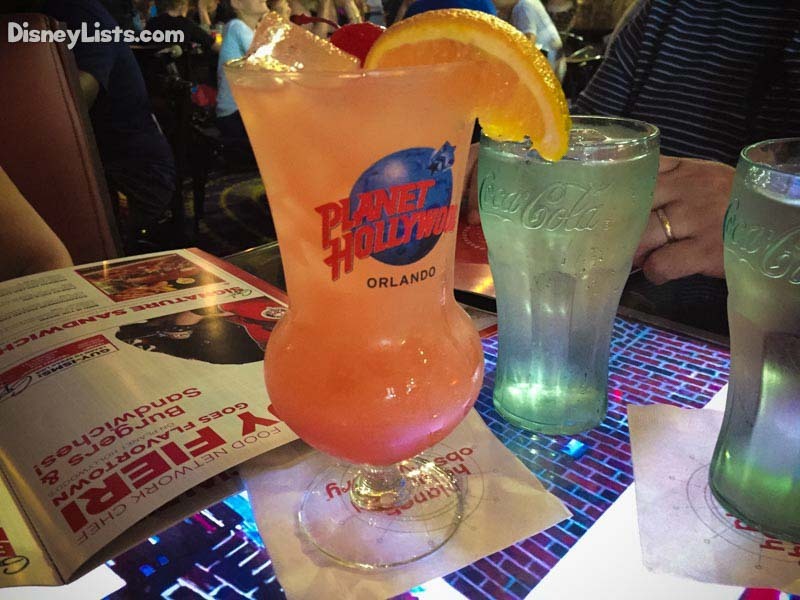 If you’ve been in Planet Hollywood chains before and enjoyed the atmosphere, well, the Planet Hollywood Observatory is like the “normal” Planet Hollywood on steroids! Of course, awesome Hollywood Memorabilia is spread throughout the restaurant. While this is an essential part of the restaurant’s theme, we were even more impressed with the layout of the restaurant from the bottom all the way to the top. A fantastic variety of music lit up the place with changing lights and massive projection screens showing music videos and other short clips. Our table… yes our table… even had a screen built-in to it! Plus, despite our eye rolls our kids loved that they actually had a moment when they played Frozen, “Let It Go” and the entire restaurant joined in singing. Not a Frozen fan? It’s all good – as it was brief and they got back to Katy Perry and Queen shortly after. We were seated in the lower level of the restaurant which was perfect for us as we had a family of six. This lower area consisted of booths and tables. We were thankfully in one of those semi-circle large booths which was comfortable. We will say however that the people seated at the tables did seem rather crowded. It looked like a tight fit with servers and food runners winding throughout the space. If you are looking for a more spacious area, you may want to request to sit upstairs. Upstairs offers even better views of the projections, or you can go outside to enjoy views of Disney Springs. Kudos to celebrity Chef, Guy Fieri, as he rocked out the Planet Hollywood Observatory menu. As we mentioned above, we’ve eaten at other Planet Hollywood locations as well as this one back when Disney Springs was Downtown Disney, and were anything but impressed. But, wow, this revamped menu is excellent and the Chefs that cooked up our meals did it right. If you really want to go big, try the High Roller Sampler appetizer. It feeds four and is served on a wheel like table display including Chicken Crunch, Texas Tostados, Buffalo Wings, Five Cheese Dip, and Peri-Peri Shrimp. Burgers of course take center stage, including Guy’s award-winning burger, the Bacon Mac-n-Cheese. Sandwiches, salads (loved the Hollywood Bowl), pasta, steak, chicken, and even lobster. The kids’ meals had a good variety as well for the kiddos to enjoy. An overall great variety of American food that’s well cooked and leaves you full. We actually forgot to take a picture of our epic dessert. Ugh! BUT – trust us, it was EPIC and absolutely over the top delicious. Outside of the normal dessert menu which is a great list in itself, Planet Hollywood Observatory has what they call Supernova Shakes. These shakes are just crazy looking but worth sharing with a loved one. The Strawberry Big Band was our weapon of choice. It’s a strawberry milkshake with what looks like an explosion of sprinkles all over the top and sides of the mug it’s served in. Even better… they top it off with a full slice of birthday cake. (We’re not joking!) Absolutely hilarious to see and even better to taste. The other two Supernova Shakes are Cosmic Cotton Candy and the Chocolate Comet. The bars at Planet Hollywood were hopping even though it was the middle of the day. We tried one of the signature drinks called The Observatory with vodka which was excellent. We also enjoyed one of the Comet Glass specialty drinks that includes a souvenir glass to take home with you! If you are looking to experience Planet Hollywood Observatory, but with more of a lounge flare? Check out the Stargazers Bar located in the same building, just upstairs. The full bar is typically very popular in the evenings and for good reasons, as great specialty beverages, beers, and wines flow from this location. Order food, check out the live entertainment, watch as Disney Springs glows at night, and keep the drinks coming! Right from the get go, the Hostess was extremely friendly and efficient. We arrived super early for our dining reservation, but she adjusted it and got us in right away with very little wait. Our server arrived quickly and was very attentive throughout the meal. He kept our drinks full and was available when we needed something. Since we have one Gluten Allergy in our party, the Chef made an appearance to take our gluten allergy order. He too was helpful and we knew the gluten allergy would be handled well. No complaints with the service whatsoever! 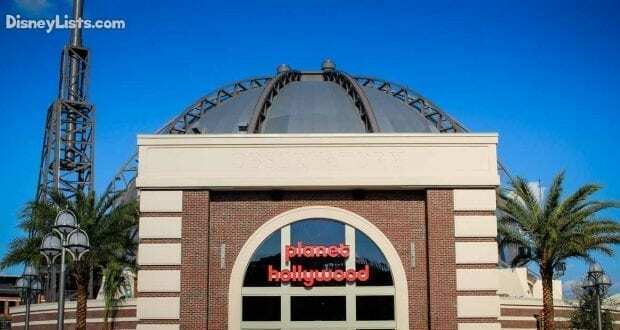 We are loving the rumor of what’s to come to Planet Hollywood Observatory and hope it launches and does well! If you aren’t the dine-in type and want to have a quick grab and go meal, Robert Earl (founder of Planet Hollywood) has suggested the will offer a quick/counter service style exterior eatery close to the restaurant itself. The word is that he’s already received permission from Disney Springs to do so. Overall, our experience was excellent and we look forward to being repeat guests to Planet Hollywood Observatory. We’d love to hear about your dining experience!